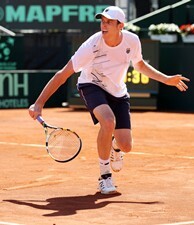 Sam Querrey made his return to the U.S. Davis Cup Team in the 2012 semifinals against Spain. For the fourth consecutive tie, John Isner will lead the U.S. Davis Cup Team as the No. 1 singles player, joining Sam Querrey and Bob and Mike Bryan on the U.S. team that opens its 2013 campaign against Brazil in Jacksonville, Fla.
U.S. Davis Cup Captain Jim Courier's squad will face off against a Brazilian squad of world No. 33 Thomaz Bellucci, Thiago Alves, Marcelo Melo and Bruno Soares, Feb. 1-3, at the Jacksonville Veterans Memorial Arena. It is the first home tie for the U.S. since the 2011 quarterfinal against Spain in Austin, Texas, and the first home tie for both Isner and Querrey in their Davis Cup careers. "We're excited about 2013 as a team," Courier said during a conference call in December. "We're proud of what 2012 ended up being for us given how challenging the draw was. We've earned some home ties this year, which we're really looking forward to, assuming we win our first one. We have Brazil, which will be challenging." Isner, the No. 13 player in the world, went 4-2 in singles play for the U.S. in 2012, including upsetting 17-time Grand Slam champion Roger Federer in the first round against Switzerland, and defeating Top 20 players Jo-Wilfried Tsonga and Gilles Simon in a quarterfinal victory over France, to help send the U.S. to the Davis Cup semifinals for the first time since 2008. Isner has faced Bellucci, likely Brazil’s No. 1 singles player, just once in his career, going 0-1, but the two have not played since 2010 or on hard courts, the surface of choice for the first-round tie. Isner has never faced Alves, the world No. 145. "[Bellucci]'s capable, but he's a guy that likes time. That's something that our team historically is pretty good at taking away from players," Courier said. "All of our singles players have big serves. That's something we'll certainly look to do with Thomaz, is to take time away from him." Querrey, currently the No. 22 player in the world, made his return to the U.S. Davis Cup team in 2012 after a two-year absence, and he will likely serve as the team’s No. 2 singles player behind Isner against Brazil. Querrey has never faced either Bellucci or Alves. The 12-time Grand Slam champion Bryans, meantime, went 2-0 together in Davis Cup play in 2012 to improve to 20-2 overall. The official order of play and lineup for each team will be announced at the official draw ceremony on Thursday, Jan. 31. The competition begins Friday, Feb. 1, and will be broadcast live on Tennis Channel, featuring each team’s No. 1 singles player against the opposing team’s No. 2 player. The doubles rubber, likely to feature the Bryans against Melo, the doubles world No. 17, and Soares, the doubles world No. 19, will be played Saturday. Sunday then will feature the No. 1 and No. 2 players squaring off. The U.S. will be the favorite, a position it never held while spending the entire 2012 season on the road, but neither Courier nor any member of the team are taking anything for granted. "Definitely the doubles team Melo/Soares is a veteran team, one of the better Davis Cup doubles squads around that plays a lot through the year. Bob and Mike Bryan have a lot of experience against them," Courier said. "But for the average tennis fan, you may not know much about these players, but from our standpoint obviously we respect them and we've played many ties against players who rise to the occasion," he added. "This will be the first time in a while that we've been a favorite, probably since Chile in 2011. But we won't take anything for granted. We'll be coming in ready to play ball." Want to come support the U.S. Davis Cup Team in Jacksonville? Click here to buy your tickets today.